A leader sets the right example. He is a role model who strongly stands up for what he believes in. 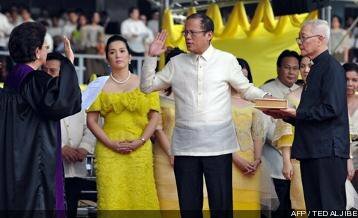 By uttering the words “Sisikapin kong maging isang mabuting ehemplo…” in his inaugural speech, President Noynoy Aquino has to be ruthlessly accountable for his words. Being against the abuse of a “wangwang”, P-Noy has chosen to travel like a commoner. Sans the siren, critics mocked P-Noy’s late arrival at the Armed Forces turnover ceremony at Camp Aguinaldo on Friday. But why does he continue on traveling without the wangwang? A leader sets the right example. Compromise destroys accountability. Wow, this is the first time I heard P-Noy speak. As in S.P.E.A.K! And I am impressed with the delivery of his speech. P-Noy’s voice has always been overshadowed by his flamboyant sister Kris. Critics asked why didn’t he mention anything about more important issues in his speech aside from combating corruption? Perhaps, because it’s an inaugural speech- it is supposed to be light, serious, inspiring rolled into one. The hard-core detailed speech is reserved for his first State of the Nation Address (SONA) on July. And since this is a celebration- finally, away from a tyrant regime- let’s give the stage to him. And as for the singing – ummmmm….. well, that’s his GLEE moment. I painted my ballot yellow because of my love for democracy. 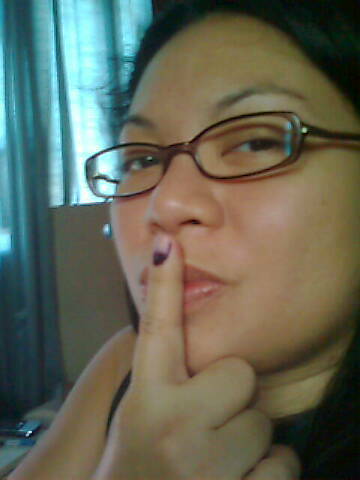 I voted for yellow because I would rather have my country in status-quo than have someone pave way for Charter Change. More importantly, I voted for yellow because of his integrity. 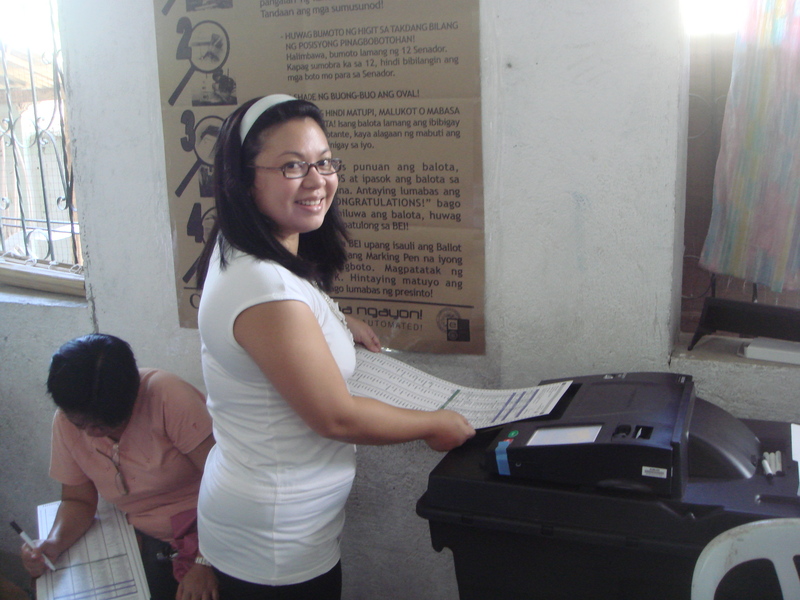 Yes, I voted for yellow, and I am proud of it! Who did you add in Facebook? Popular social media networks such as Facebook, Youtube, Twitter now play a big role in persuading the eleclorate. 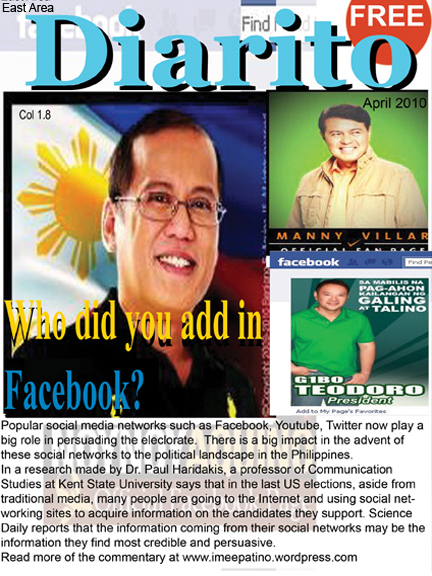 There is a big impact in the advent of these social networks to the political landscape in the Philippines. In a research made by Dr. Paul Haridakis, a professor of Communication Studies at Kent State University says that in the last US elections, aside from traditional media, many people are going to the Internet and using social networking sites to acquire information on the candidates they support. Science Daily reports that the information coming from these social networks may be the information they find most credible and persuasive. Analysis: The internet plays a big role in choosing candidates. Some people would go out of their way to research each ones platform, most, however, depend on others ‘links’ sent to them via Facebook , twitter, or other social network. But then again, only a small margin of Filipinos have access to the internet. Most still depend on television- still the current influential tool to get free news. The success of Manny Villar’s ad is because it targets the majority of Filipinos who are poor. He shows that there is hope for them to have a better life like him and his humble past. His approach is “messianic” – that he will be able to bring them out of poverty especially with his campaign jingles – heck, even my 10-month old son loves listening to the song “Di bawal mangarap” repeatedly. But just like my son, most of the Filipinos stop at the advertisements alone. They forget to dig deeper, or even ask themselves: Will he really get us out of poverty or is it just a ploy to make him president? When he becomes president is there a possibility that he will lead the way to Charter Change? My son is just 10-months-old, but then he knows Manny. He loves Manny! A big applause to his campaign people, but that does not mean I will vote for him. 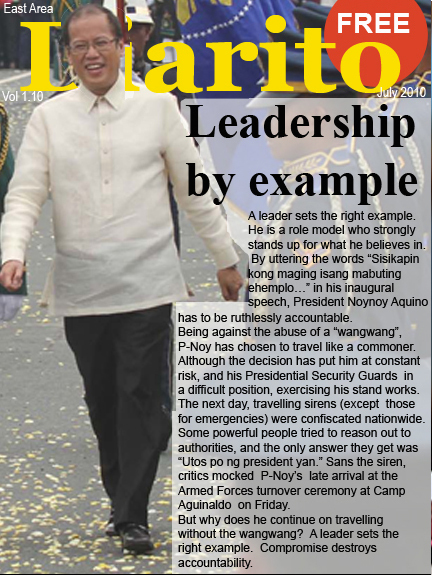 Noynoy Aquino lacks the strength in his campaigns. Perhaps they did not hire the qualified people to handle it – maybe they really do lack the funds [unlike Villar] or maybe Kris Aquino thinks she will be able to influence the masses by being cute, smart and funny. Apparently, it’s back firing on her – you cannot underestimate the mind of Filipinos anymore. But speaking about Noynoy’s campaign, I don’t believe it’s all about the lack of funds though, I believe they lack the creativity. In comparison to Barack Obama’s campaign in the last US election, Time magazine reported that his campaign started from his own backyard with very little funding. Not many heard about him before. It’s not like he’s the first African-American to run for president – Rev. Jesse Jackson was a candidate for the Democratic presidential nomination in 1984 and 1988 but didn’t win. What Obama had, aside from the fire within, were the right strategies and the right campaign people. Alas, Noynoy should really listen to all the best strategists who are already handing him the right way to do it, just so, the country can remain status quo. Gibo Teodoro, the Galing at Talino, but the presidentiable who fails to inspire the masses. I respect Gibo – his educational background, no doubt he deserves that slogan. But even if he has everybody’s respect, he cannot get everybody’s vote. He fails to reach out to the masses. Erap Estrada is even higher than him in the surveys. So where did he fail? But is there still time to take another campaign route for these men? So which presidentiable did you add in your Facebook?